With fall in full swing, I have been craving everything pumpkin lately. I know a lot of people don't wait until fall to get their pumpkin on, but I like to wait until the season has a good head start. While waiting in line at Starbucks recently, I spotted some pumpkin bread and decided it was time to embrace everything pumpkin. 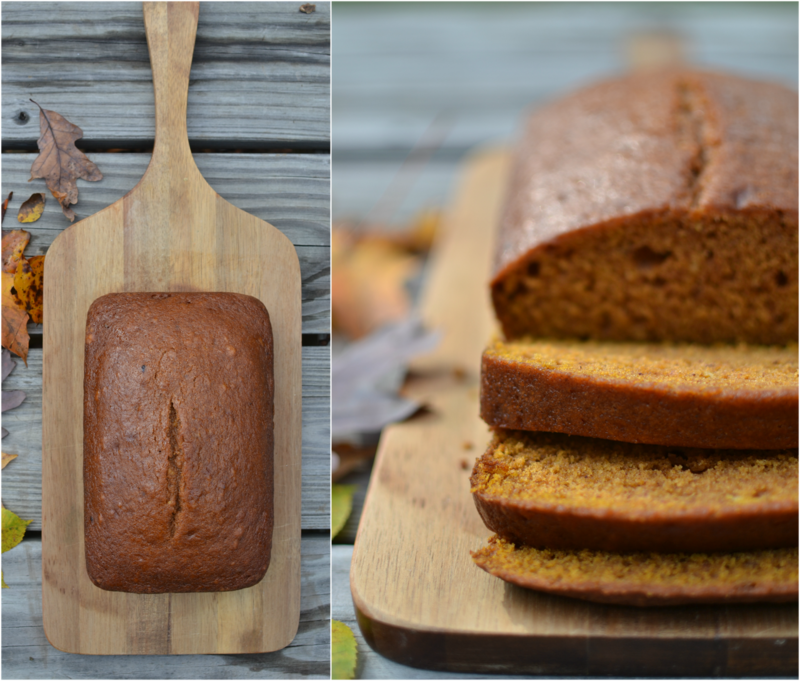 I was inspired to make my own pumpkin bread at home, and let me tell you - it was one of my favorite things I've ever made. 1) Preheat oven to 350 degrees F. Lightly grease two loaf pans. 2) In a large bowl, beat together the oil, sugar, eggs, pumpkin, and water. 3) Add the flour, baking powder, baking soda, salt, vanilla, and pumpkin pie spice, stirring to combine. 4) Divide batter evenly between loaf pans and bake 60-70 minutes or until cake tester inserted into the middle of the loaves comes out clean. 5) Cool bread completely on a wire rack, then wrap well in plastic wrap. This bread totally surpassed my expectations. I honestly couldn't believe how good it was! Maybe after my last baking session resulted in an epic fail I was just thrilled that something turned out right, but really this bread is so delicious. The recipe recommends you wait overnight to eat the bread because when it rests for a while in the plastic wrap, it gets so moist and flavorful. Since the recipe bakes up two loaves, I sliced one and put it in the freezer for longer storage (I made sure to wrap it tightly in plastic wrap covered in aluminum foil to prevent freezer burn). This morning I took one slice out and brought it to work with me for a mid-morning snack, and it tasted just as good as when it was freshly baked. I love that the bread isn't too sweet, but just sweet enough and the spicy pumpkin flavor really shines through. I think baking this bread will become a fall tradition for me! "get their pumpkin on"--love it! Stunning photos! You make me want to take more time with my recipe posts. 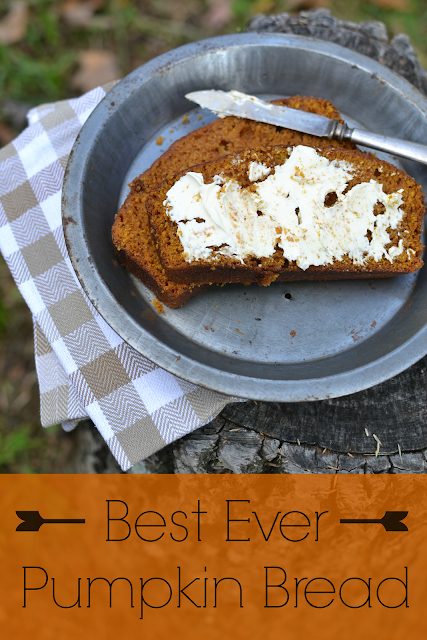 Punkin' bread is my boy's hands-down fav breakfast! Yours looks SO moist! Enjoy! It looks delicious. I am obsessed with all things pumpkin, so I will try just about any recipe that includes pumpkin! Yum! The bread sounds delicious and I love your photos, very nice! Thanks for the recipe and you have nice pictures of it. I'm always looking for new versions of old favorites :) Hoping to give yours a try- it really sounds amazing! Your photos are beautiful!!! I wish I had a slice right now! This sounds good. I like pumpkin bread any time of the year! Yum. Will bake some immediately. Thank you! Yummy! This sounds great! I will be trying this, we love pumpkin. Thank You! I have been baking pumpkin bread every couple days for the last couple weeks. My family is inhaling it and truth be told me too... So good with some soup or by itself. YUM! Your pics are awesome and I super love the last one and the glimpse of your table. Your bread looks delicious--and your food styling and photography are terrific, as usual. You always have the coolest pans and dishes and silverware! I love pumpkin bread. This recipe looks great! I'll have to give it a try. This looks good. I work with a lady who makes pumpkin roll and brings it to us during the fall. Delicious. It looks absolutely delicious!! I marvel at your photography - you should really think about submitting to magazines. Have you ever looked into it? I can help you with a couple of them possibly. If you're interested, let me know. Your photos are amazing and this bread really does look out of this world yummy. I made mine last week but banana bread is most definetely in this weekend's rotation. Perfect for Fall! Oh this looks most excellent. Must try soon!! I love when you bake! Sounds delicious, and this needs to go on my baking list soon! Oh wow that sure looks like the best pumpkin bread ever !!! SUper photographing of it too ! Yum!! I will try this one! Looks delicious! Now you have me drooling for all things pumpkin. Tammy, your pumpkin bread looks and sounds delicious! I will have to try your recipe. Thanks for sharing. Have a happy day! i'm not a fan of pumpkin but i have to say that it looks really good! Oh my lord I would eat this breakfast, lunch, and dinner. Is that wrong? Yum - this looks delicious! I love your last photo - you could be a food photographer, it's just to inviting! How delicious! And what great shots. This is bookmarked and I am gonna make this as soon as possible. I love, love, love the idea. And I will have to forage your site to see if I can find a banana bread one too as I am not good on that. Gorgeous bread, Tammy! And just the kind of recipe I'm in the mood for! I will definitely make this after our out of town guests leave and we get back from our own quick trip out of town. I LOVE pumpkin bread. It always reminds me of when I was a kid in school and every Friday they would make pumpkin bread. It was so good. It made Friday even a little bit more special. I am going to have to give this recipe a try. I have been using the one out of my Betty Crocker cook book. Your photos look fabulous my friend. If you grew your own pie pumpkins you could make pumpkin bread whenever you wanted. Oh wait, I guess you can with canned pumpkin as well. Enjoy your bread! As always, your images of food are very well made and so tidy. Looks great, I love pumpkin bread, I am going to try yor recipe. I enjoy baking too. Hi Tammy! Love your 'neck of the woods'! The recipe looks so yummy! I'm going to make some today! Thanks for sharing! Blessings from Bama! Just made the pumpkin bread, it is Awesome! Thanks for sharing the recipe! I just wanted to stop by and let you know that your post will be featured at Thursday's The Thankful HomeAcre Hop. I will also tweet, facebook, and +1 your post.